cooking masala rice is very simple without any complicated steps in it. basically, the recipe is very similar to the traditional pulao recipe prepared across india. 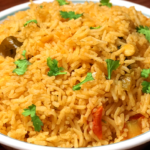 a flavoured and spicy rice recipe prepared with dry spices and vegetables. it is a one-pot meal and hence an ideal lunch box recipe and easily appreciated by kids and all age groups.